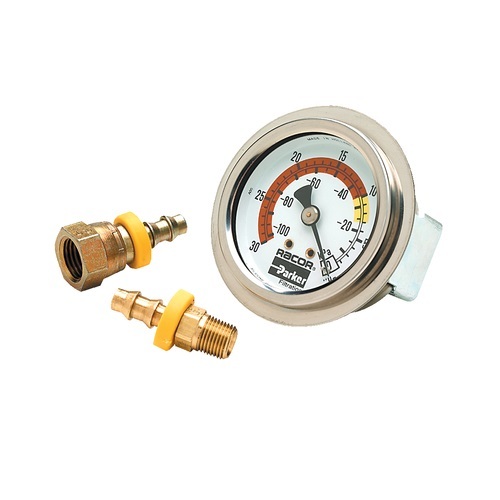 The Racor 1606B is a vacuum gauge kit that assists in monitoring your fuel filter element / filter. This kit includes: (1) gauge and (2) fittings-1-1/4 female swivel x 1/4″ hose barb and 1-1/8 male NPT x 1/4″ hose barb. The Racor 1606B is a vacuum gauge kit that assists in monitoring your fuel filter element / filter. Internal pressure slowly increases as the element / filter becomes clogged with contaminates. The benefit of installing a Racor vacumm gauge on the outlet side of the Racor fuel filter assembly, you can visually monitor the element condition at a glance. Once the gauge points into the red area of the gauge, you are aware that a filter change is necessary to avoid; fuel starvation, filter damage, injector clogging/ damage, etc. This kit includes: (1) gauge and (2) fittings-1-1/4 female swivel x 1/4″ hose barb and 1-1/8 male NPT x 1/4″ hose barb.